Please follow these directions to install Google Drive on your Apple computer. 3. From the gear icon on the right side of the screen, select "Download Drive"
4. You will now be taken to a new page. 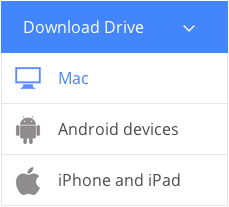 Hover over the blue "Download Drive" menu and choose "Mac"
5. Next click "Agree and Download"
8. 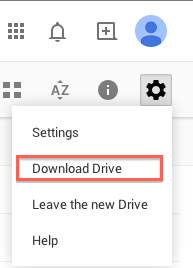 If you are presented with a warning message that Google Drive already exists, choose the option to replace. This will ensure you have the latest version installed. 9. Next go to the Applications folder and find the Google Drive app and double click it. If presented with the following error message, click "Open"
10. You should now be presented with the following screen, click "Get Started"
12. Click "Next" on the following screens until you have the option to click "Done"